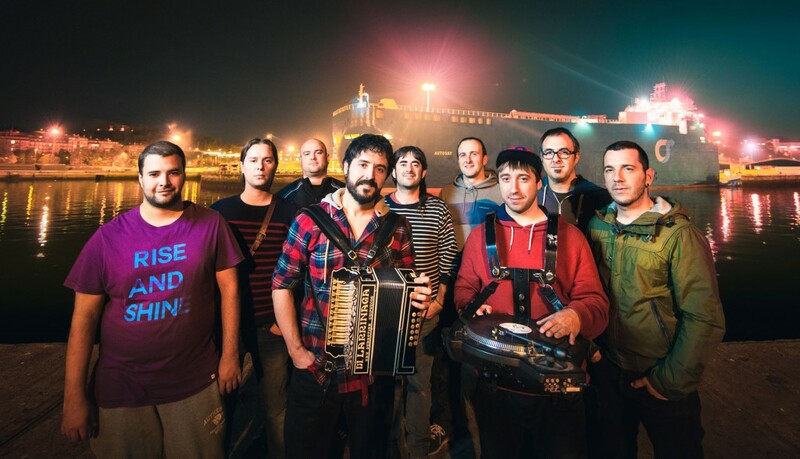 The band formed in 2007, when founders Xabi Solano (vocal and Basque accordion) and DZ (turntablist) were performing in the band of Basque region’s most famous rock musician Fermin Muguruza. Fermin in fact gave the band its name, Esne Betlza meaning leche negra in Spanish, or “black milk” –– reflecting what Fermin saw as the paradox of “white” Basque musicians adapting Afro-Caribbean musical forms. Their lyrics, which they describe as “short stories in which pretty word flow” are largely written by the poet Jon Garmendia, who is not a band member. Ahead of Esne Betlza’s return to Fuji Rock in 2018, band leader Xabi Solano took time for this email interview with Fujirockers.org to let us know what to look forward to on this visit to Japan. all around the world. The public’s energy was incredible. Q: Since it’s been almost 10 years since your last visit, what are the major highlights for Esne Beltza from the last few years that your Japanese (and Asia-based) fans should know about? vibes. We also incorporated a new member to our team: Pini, a reggae dancehall singer. Since our last visit in Japan, we produced 5 CDs and we are now working on the new one. Q: Esne Betlza’s music pays hommage to the tradition of trikiti, the traditional Basque musical groups, which includes an accordion. Is Basque music the real origin of this accordion music that the world now thinks of when they think of “romantic” Europe, like France and Italy? You haven’t understood the idea yet. Italian workers came to the Basque Country in the XIXth century to build the train lines and introduced the instrument to our lands. Then we adapted it to our tradition and style of music. Q: How did DZ start to wear his turntable on a shoulder harness. It’s really cool, like he’s in a marching band. Does he wear that in stage shows, or only on special performances? How did this start? And what was the reason? The idea comes from a guy from Switzerland who makes portable turntables. However, he only uses it in special performances because it’s less precise and quite unstable. Q: DZ and Xabi both used to play with Fermin Muguruza, and I’ve been told that Fermin actually gave the band its name, which means leche negra in Spanish, or “black milk”. Is Fermin still involved with Esne Beltza? and helps us. He’s a very influential artist in Basque culture and music. Q: There are lots of political statements in punk and rebel music as it is played all over the world, but in Spain, Basque Countries, Catalonia, and maybe more generally south Europe (France, Italy) and even Latin America, there is a particular sense of a fight against Fascism. Is this because the history of Fascism is more recent there? In Spain, Franco was in power until only about 40 years ago, and military dictatorship is a living memory in many Latin nations. How does this legacy affect your music. For example, your most recent Europe tour was titled “Don’t Give Up the Fight”. What is your fight? Music is our way to express our social worries and questions. We actually believe in the right of self-determination, feminism and global human rights. Q: What else are you looking forward to at Fuji Rock and in Japan? To share our music and culture, have a great time, and know better Japanese culture!